Just the place to witness and take part in colourful festivals round the year, Puri is famous for its celebrated annual festival of Chariots, the Ratha Yatra. Held in the beginning of the monsoon it has been attracting pilgrims and tourists for centuries. 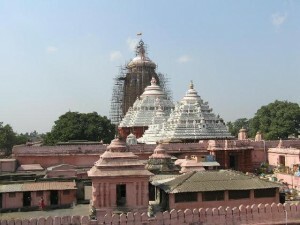 The main temple a majestic structure of 65 mts. high, stands on an elevated platform in the heart of the city. Its swirling pinnacle commanding the landscape for miles around. It is a monument of the 12th century A.D. with all the richness and plasticity of the Kalinga style of architecture.Apart from the main temple one can see within its precincts a host of other smaller temples including Goddess Vimala, Laxmi and Vishnu. The festival Chariot known as the Ratha Yatra, an annual ritual spreading over the entire summer and monsoon months, makes Puri attractive and enjoyable for tourists. The moving images of the deity take a ritual boat ride after a refreshing bath in fragrant sandal wood scented water. During this period the devotees have to be satisfied with a darshan of images of the Lord on cloth paintings or Pattachitra. Then comes the annual journey of the three deities on Grand Chariots to their garden house.On the way their aunt feed them with Podatitha (specially baked rice cakes). The deity on reaching Shri Gundicha give darshan to the countless devotees every day and after a lapse of eight days, return to the main temple riding their Chariots. This entry was posted in Jagannath Temple, Orissa. Bookmark the permalink.